Home improvement retailer Lowe's Companies Inc. (LOW) may not be as big as Home Depot (HD), but its stock should be at least priced on par with the larger rival. It's that simple. Lowe's generated $3.7 billion in net income on $71.1 billion in sales from 2,133 stores versus Home Depot's $105.5 billion in sales and $8.6 billion in profit from nearly 2,300 stores. Home Depot's forward earnings multiple is 18, while Lowe's is 16.6. Home Depot trades at 1.9 times sales and 16 times cash, while Lowe's is priced at just 1.1 times sales and 13 times cash. Getting to parity would put Lowe's stock in the $140 to $170 range. Warning! GuruFocus has detected 3 Warning Signs with LOW. Click here to check it out. Lowe's delivered solid fourth-quarter results on Feb. 27, with sales up 1.7% to $15.65 billion and a $1.6 billion loss on nonrecurring charges related to the closing of Orchard Supply and its Canadian and Mexican operations. This one-time charge is irrelevant to its future potential as it still posted non-GAAP earnings of 80 cents per share, keeping it on track to post $6 per share in 2019 and $7 per share in 2020. Getting out of ancillary businesses (like Orchard Supply) and closing underperforming stores (like the one's in Mexico and Canada) are part of the company's turnaround process, which also includes website enhancements, inventory investments for deeper assortment and a renewed focus on core home improvement operations. Trade relations between the U.S. and China will be a key to 2019 performance, but in the long term, home improvement will likely remain strong as more and more homeowners continue to renovate and redevelop properties across the country. Lowe's enjoys an increible 48% return on equity, but has depleted its retained earnings on property and other investments, along with stock buybacks. Since the 2009 housing crisis, this has helped its stock skyrocket in value, and it continues to be a dividend champion with over 40 years of dividend growth. We are coming up on the spring home buying season, which are historically the best months for Lowes. 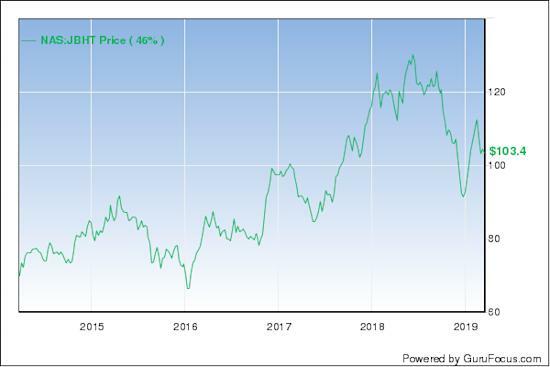 At some point in the future, as the company reaches maximum market capacity, the dividend payout ratio will have to move closer to 100%, but until that happens, Lowe's should continue to grow regardless of any short-term turbulence in the housing market. Again, if earnings meet expectations in 2019 and 2020, then the stock won't stay at the $100 per share level for long.